Naughty or nice, you can use his power to keep Christmas craziness in check. Santa's Naughty Or Nice List by Daniel Storm is a clever fingerprint-analysis-style prank that informs users if Santa has found them naughty or nice. By pre-setting the results to either, or by choosing "Let Santa Decide", you'll have a nicer way to tell them how they've really been acting all year. By the way, if this app only fools kids into thinking Santa's watching, you can also download the "CIA Fingerprint Scanner" prank app and convince your drunk buddy that he's actually being investigated for arson. Yet another Santalyzer is available in app form, this one utilizing the voice of the big man himself. Santa's Naughty Or Nice List by Net Unlimited has all of the judgement delivered in the robust tones of the jolly old elf himself. Tell the kids you have him on speakerphone, and that he has NOT been happy with you. "Ho ho hold your finger on the glass so we get a good scan, this is a critical Naughty list update." Graphically speaking, you can't go wrong with Santa's Naughty Or Nice Scan-O-Matic by Spilled Coffee Media. It features the standard Nice List bouncer of an app, as well as a countdown to Christmas and a "Santa Watching" light that indicates in red or green if Mr. Claus is in his office handling the business of niceness at the moment. Perhaps you'll be just a little bit nicer just by pretending it's real. 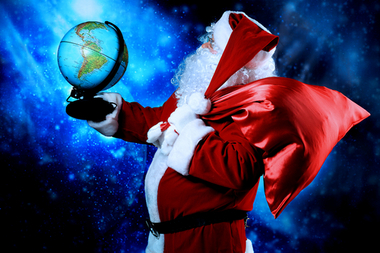 And if you already know for sure where you stand on the list, but want to try to have words with the big man himself, try using the Where Is Santa Lite app which updates in real-time for Claus-marks around the world, Learn distances between Santa and yourself, plus count down to Christmas in style. NORAD also has a similar app, which will teach kids that truly, someone is always seeing them while they're sleeping, and knows when they're awake. No, it does not have a link to Santa's Growlr profile. Glad tidings, and may Santa have mercy on your souls. You can't hide. Just stop being a terrible person.